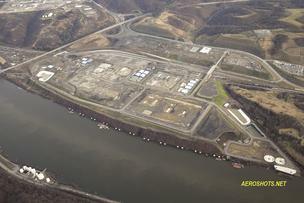 Aerial view of development around the ethane cracker project in Beaver County. A report released Wednesday by two of the region’s biggest natural gas companies lays out a strategy to help boost Pennsylvania’s economy, including a comprehensive plan to supercharge the burgeoning petrochemical industry. Chevron Appalachia and Peoples Natural Gas commissioned the Forge the Future study, which was unveiled by Chevron Appalachia President Stacey Olson and Peoples CEO Morgan O’Brien during the first day of the Shale Insight conference in downtown Pittsburgh. The companies hope to start a private sector-led effort to get natural gas- and manufacturing-friendly policies to unlock what they called a potential $60 billion economic windfall and 100,000 more jobs over the course of the next 10 years. Create energy-based industry clusters around petrochemicals, advanced manufacturing and large data centers. These can be clustered together to catalyze growth, Olson said. That includes the creation of a petrochemical hub, along the lines of what the tri-state region is attempting, that will build a number of petrochemical plants in the region that would include three to five more ethane crackers beyond Shells $6 billion plant in Beaver County as well as facilities to make olefins, ammonia and other inorganic chemicals, as well as attracting manufacturers that make specialty products. Move forward quickly with pipeline projects to take natural gas from the Marcellus and Utica shales to market. Increase the use of natural gas power and heating programs across Pennsylvania. Peoples O’Brien asked the Shale Insight audience to help with the Forge the Future effort, and said that no one was taking the initiative right now at any level. He said that’s why Peoples was enthusiastic about Forging the Future. We want to be a part of the excitement of what the future of the incredible resource we have and trying to connect the dots for people, and help them literally see the opportunity we have in front of us, he said. He said it was a nonpartisan effort and it didn’t matter what party was in charge. This article does not tell the true story of this Washington PA DEP hearing. More than 35 speakers spoke in favor of natural gas development while about 20 speakers were opposed. DEP proposed rules will adversely affect further natural gas development in PA.